Welcome to the NBA 2K14 portal! 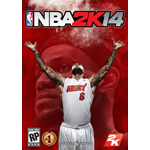 This is a central hub for all the NBA 2K14 content here at the NLSC including news, reviews, feature articles, downloads and more. Download a Barkley Challenge mod, along with a new face update for Nikola Jokic, in the latest File Additions for NBA 2K14. In this week's Monday Tip-Off, Andrew discusses how the regional division of users in NBA 2K PC has led to empty Neighborhoods, and less online activity. In this week's Wayback Wednesday, Andrew takes a look back at how MyCOURT has evolved since its debut in NBA 2K15's MyCAREER. Download retro jerseys for the Indiana Pacers, and a couple of player face updates, in today's File Additions for NBA 2K14.